Looking for an alternative to the high prices, poor quality, or lack of support you receive from your current board test ATE supplier? 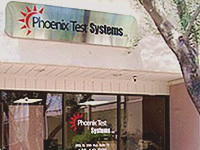 Established June of 2005, Phoenix Test Systems offers the highest quality in reconditioned in-circuit ATE, parts, service, and support available, at a fraction of the cost. Our mission: to provide superior quality systems, service, and support at a fair price to all our customers, big and small. At Phoenix Test Systems, its all about you, the customer. Agilent/HP 3070 and 3065, GenRad 228x and 227x, and Teradyne Z18xx. Systems, Parts, Board Repair/RE, Calibrations, On-Site Service, Support Agreements, Upgrades, Training, and Technical Support. With over 20 years of extensive hands-on experience, our technical staff is here to help. Its like having a full time support engineer on the payroll, without the overhead! Service and Support is availabe for Agilent/HP, GenRad and Teradyne ICT Systems. Need a QUOTE on services? Board Test ATE Systems, Parts, Spares, Upgrades, Repair and RE. We also offer Support Contracts, Calibrations and more. Quotes are also available by phone.